In this guide I will be using Vultr as my VPS of choice. 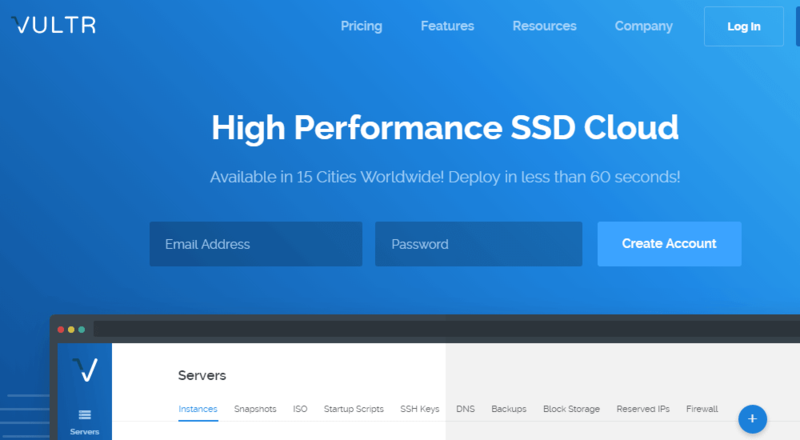 Vultr is an amazing Cloud Server provider, a great alternative to Linode and Digital Ocean. Check out all their offers and pricing here. Setup CentOS 7 with new user, Firewall and more, all while using Putty on Windows. Note that these steps can be used on any VPS, once you install your CentOS 7 server. Go to Vultr.com and set up your account. Choose the amount to pay and the method of payment, agree to Terms and Conditions and then click on the Pay with button. Finish the transaction. After which you will be able to deploy a server on Vultr. Once you have some credit on your account you can now launch a server. On the top right of your screen click on the blue plus ( + ) button to deploy a new server. Next Choose your preferred server location. Choose any location, however one closest to where your web visitors are located is best. Next, scroll down and choose the server type. This is the Server OS that will be installed on your deployed Server instance. In my case, I will choose CentOS 7 , the 64 bit version. If you will be following along with me I suggest you choose the same. Then scroll down and choose your server size. This is billed hourly/monthly so choose the resources that best fit your server needs. You may choose any of the servers. Under additional features I will check all the unpaid options as shown below. Then, leave Startup script and SSH keys as is for now. We’ll create SSH keys using Puttygen and add it to our server later on. Put in your Server Hostname and Label . Give a name based on the domain you want to use with it. Any subdomain name should do. Let it be some domain you own because if you will be hosting a website on it, you will need to add DNS records and match it with your Vultr account IP. When all is done click Deploy Now. Give it time to deploy and install. Putty / Puttygen : You can download and install them separately or you can choose the option that comes bundled with everything. Putty is free – Download Putty . The following is an adaption from the Vultr guide. I have adapted the guide to suite beginner Windows Users who would have definitely gotten stuck at some point during the user set up and root user deactivation. By now you should have installed both Putty and Puttygen. In this first part we’ll use Putty. Actually we’ll use it throughout. We’ll only use Puttygen once, we’ll use it to generate our Public and Private SSH keys .That will come later. First you will need to locate your server password on Vultr as directed below. Note that this steps can be used on any VPS as long as you have installed CentOS 7 and you have your password and other credentials. You will see your password, username and other details about your server. By default the username is root and the password is provided too. Just click on the copy icon to copy your password. Password – Copy it from your Server management dashboard (visible from the screenshot above). Open Putty . If you are on Windows 8 and above, just search ( Windows Key + W) for Putty and open it. Then Add your IP address under Hostname (or IP ). Save the session so that you don’t have to type your IP every time. To do that, give the session a name under saved sessions. Then click save. To save the session. Do all the above as marked in the screenshot below. Now every time you want to login you will just double click on the session you stored. Then put in your username and password on the putty command window. Double click on your newly stored session now. A prompt will appear as shown below. Click yes. Then copy your password from your dashboard. Then right click once to paste it into Putty. While inputting the password, you will not see any output. Just press enter to log in. Tip: To paste anything into putty, just right click once. Congratulations you are now logged into your server and we can begin setting things up. The following steps are adapted from the Vultr Centos 7 setup guide. Set a password for the new user. You’ll be prompted to input and confirm a password. Add the new user to the wheel group so that it can assume root privileges using sudo. Finally, open another terminal on your local machine and use the following command to add your SSH key to the new user’s home directory on the remote server. You will be prompted to authenticate before the SSH key is installed. End of Will Not work on Windows. First of all, we need to generate SSH Keys. You have installed Puttygen. Open it up. We are going to generate public and private SSH keys. Once PuTTygen is opened, click generate and Keep moving your cursor in the area highlighted with the red box. Keep Moving the mouse randomly until the Key is fully generated. For extra security, Add a Key Passphrase to your SSH keys. Then click , Save Private key. Store it in a secure area because without it you will not be able to log into your Server after we disable password and root login. Also ensure you can remember you Passphrase because there is no way to retrieve it. Don’t close puTTygen yet. Copy all the Text in the text box Under : Public Key for pasting into openSSH.. Copy it into a text editor because we’ll use it in a moment. Ensure when you copy it, it is pasted in a straight line as follows . Save the file because you may need it in future. First, open a new Putty Window because we need to log into our server again. Open Putty, double click on your saved Session. [ Important ] This time round we’ll use your newly created user, not the root user. Enter username as the new User you have just created. Enter the password you created for the new user. Note that all commands will now be executed using sudo since you are not the root user. The first time you invoke sudo, you have to enter your password. This will be the password you did set for your new user here: passwd joe . Paste the below into your command window. This will create the directory and then the second will open it in a command editor called nano . You will then be able to paste your public SSH key in there. Nano is going to open up authorized_keys. Copy the public key you saved from puttygen . Right click to paste. Ensure it is copied in a straight line. In one line that is. Then press CTRL X to exit. Then Y to accept changes. Then press enter. Now let us change the permissions for the folder and the public Key Enter the commands below. In the above (that is, sudo chown -R joe:joe /home/joe ), change all instances of joe to the non-root user you created. You will need to confirm that you can login into your Server via SSH. This is because in the steps below you will disable password login. You don’t want to get locked out. First enure your non-root user can login via SSH only. Let us login via PuTTy . Add the Hostname or IP. Use your IP from your Vultr Dashboard. Then ,all the way down at the bottom you will see SSH. Expand it then click on AUTH. Then click on Browse and browse to the location of your private key. It is stored as .ppk. Let us save this session so that we don’t have to do this every single time we want to log in. Scroll up to Click on session. Under Saved sessions, give it a name and click save. Double click on the new session you have just created. Then log in as the user you created, the non-root user. If you added a Passphrase for your SSH key, then type it in. If you log in successfully then the SSH has been setup correctly for your non-root user . Hence you can now disable the root user login and you can also disable password login into your server. All these will be covered below. That’s it for the Windows Solution Section. You may continue on with the Vultr Guide below. Continue from step 2. After the key has been installed, log into the server using the new user account. If the login is successful, you may close the other terminal. From now on, all commands will be preceded with sudo. Since you can now log in as a standard user using SSH keys, a good security practice is to configure SSH so that the root login and password authentication are both disallowed. Both settings have to be configured in the SSH daemon’s configuration file. So, open it using nano. Look for the PermitRootLogin line, uncomment it (remove the #) and set the value to no. Save and close the file. (CTRL X to exit and then Y to confirm changes . And then enter) To apply the new settings, reload SSH. Where it says, US/Eastern. Just use Your continent /your capital City. Saved me a lot of time trying to figure out my timezone. Eg , I used : sudo ln -sf /usr/share/zoneinfo/Africa/Nairobi /etc/localtime . Try it with any location eg Europe/London , Australia/Canberra etc. Afterwards, verify that the time is now given in localtime by running the date command. The EAT in the output confirms that it’s localtime. By default, the active firewall application on a newly activated CentOS 7 server is FirewallD. Though it is a good replacement for IPTables, many security applications still do not have support for it. So if you’ll be using any of those applications, like OSSEC HIDS, it’s best to disable/uninstall FirewallD. Configure IPTables to start automatically at boot time. IPTables on CentOS 7 comes with a default set of rules, which you can view with the following command. You can see that one of those rules allows SSH traffic, so your SSH session is safe. That command will save the rules to the /etc/sysconfig/iptables file. You can edit the rules anytime by changing this file with your favorite text editor. Just after or before the SSH rule, add the rules for HTTP (port 80) and HTTPS (port 443) traffic, so that that portion of the file appears as shown in the code block below. Save and close the file, then reload IPTables. With the above step completed, your CentOS 7 server should now be reasonably secure and be ready for use in production. yum-cron is a simple way to call yum commands from cron. It provides configuration to keep repository items up to date, and to check for, download, and apply updates. Open the configuration file and edit it. That’s it for this guide. Follow through carefully. If you rush, you may have to destroy your server and start a fresh. If you need to run multiple websites and you need an easier way to manage them all, the option would be something like a Web Host Manager . Kinda like CPanel, but Cpanel is expensive. So I would suggest VestaCP which is free and open to all. There are lots of tutorials about it on Google and even on YouTube. Feel free to check it out. Or any of it’s alternatives such as Webmin,Sentora, CentosWebpanel etc. By the way, on Vultr, once you create your Server, you may want to destroy it to avoid being charged for it while you are not using it. If that is the case, you may create a snapshot of it before you destroy it. Then use the snapshot to launch a new server the next time you are deploying a new server. To create a snapshot of your new server, navigate to the server management area for that server instance (Just by clicking on its name). Then click on Snapshots. Give the snapshot a name and Add snapshot. That’s it. To restore the Snapshot, when you are deploying a new server, under Server Type, click on Snapshot, then choose the snapshot you created for your instance. Choose everything else in the same manner we did while we were deploying the CentOS 7 server. The only difference here is that, Instead of choosing a CentOS Server or an Ubuntu Server and so on, you will choose a snapshot. This will save you A lot of Server set up time. Create a Digital Ocean Account. Not sure if VPS is the way to go? Check out the Web Hosts I recommend.